Lisa Jayne Creative is a designer who makes (amongst other things) incredible bespoke wedding stationary. She first came across my dresses on a shoot we were both involved with, and happily got in touch when she started planning her own wedding. 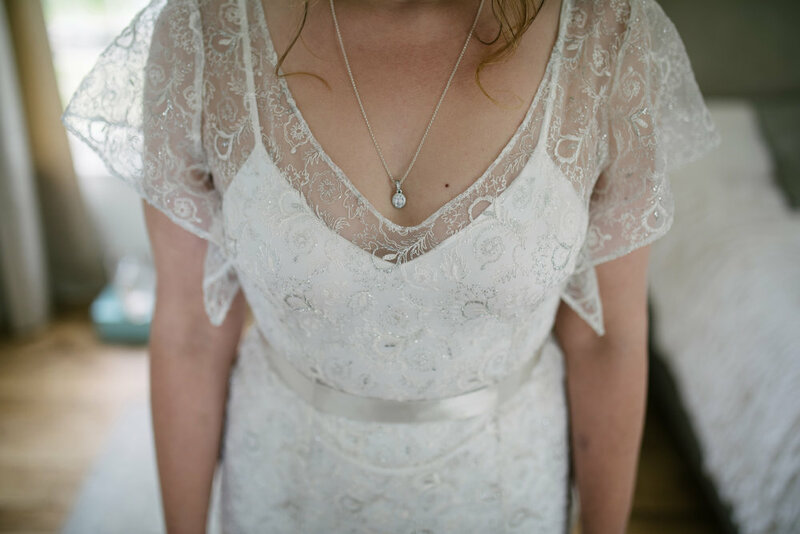 Lisa’s Grandma had given her her own 1960s wedding dress, for Lisa to sell and put the money towards her own dress. But Lisa loved the idea of reworking the dress into something new, and so together that’s what we set about to do. 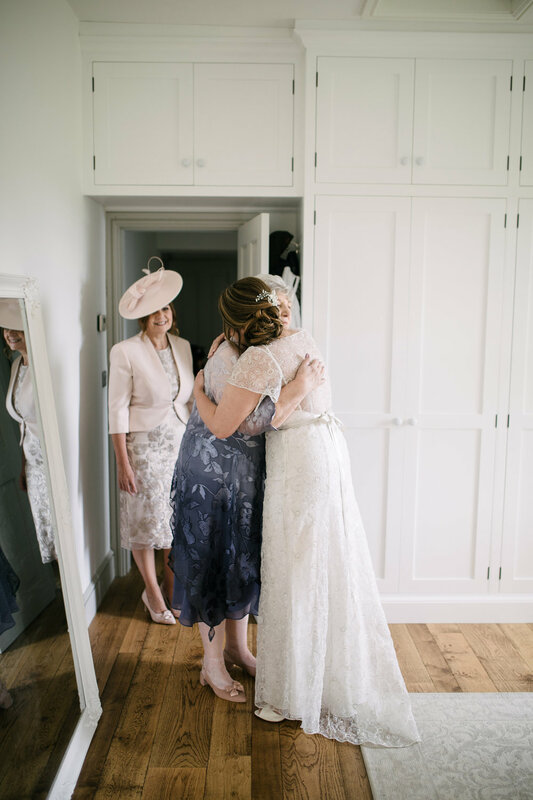 Lisa chose a bespoke version of my Anemone gown with added floaty sleeves, which I made from the selvedged embroidered organza of her Grandma’s dress. Underneath I made a bias-cut slip from ivory silk-satin, which set off the silver and cream tones in the embroidery on her over-dress. 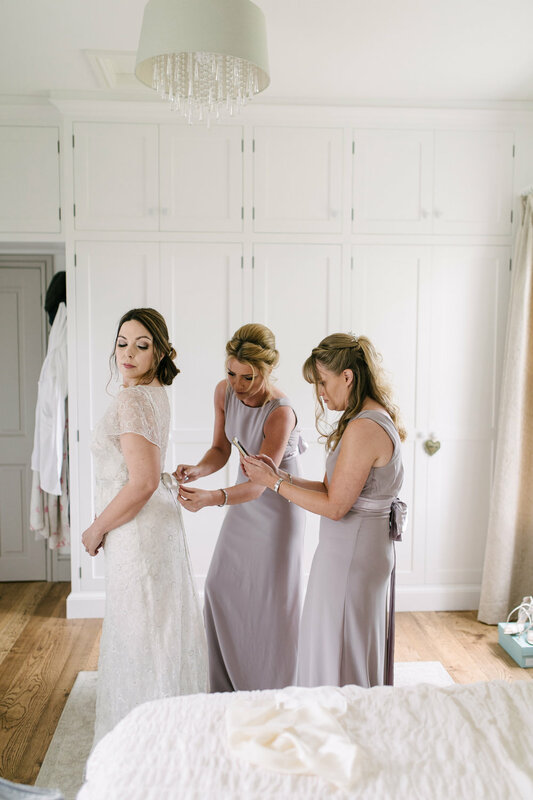 Lisa managed to keep the dress secret from her Grandma, and her face when she sees the finished dress on the morning of the wedding is an absolute delight! Lisa and Mat held their wedding on Mat’s family farm in Lincolnshire. They hired a marquee for dining and dancing in, and held their humanist ceremony in an old barn which they decorated for the occasion. There were lots of outdoor activities to keep children and adults entertained, and most guests stayed over and camped onsite. The day was heavy on detail and meticulously planned, with Lisa’s designer flair visible everywhere – most of the décor was made by Lisa or Mat, or found on the farm.